What makes the Brazilian Mega Senna Lottery so special? 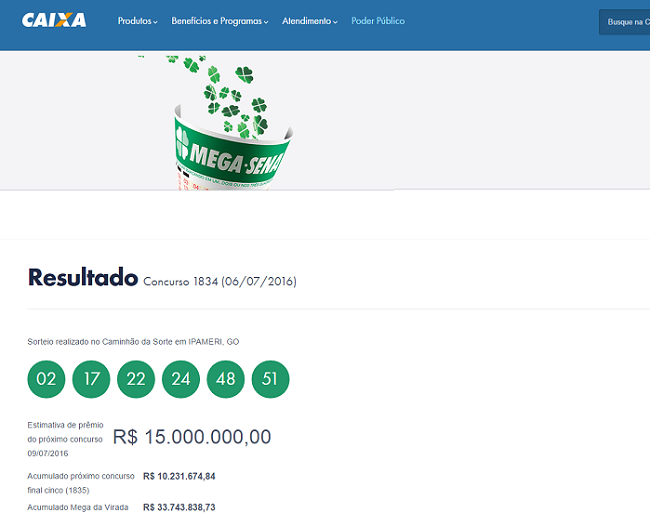 Almost every Brazilian knows the Mega Sena Lottery. Over the past few years impressive Jackpots and prizes have been won with this lottery. The fact that you don’t have to pay taxes makes it even better! What else makes the Mega Sena Lottery very special? Mega Sena is not a new lottery actually. It’s already more than 50 years old. The Lottery was established by the Caixa Economica Federal Bank in 1961. At that time the main goal was to raise money for social and cultural advancement programs. In the long history of Mega Sena, some special things have happened. Many Brazilians are aware of the ‘’Mega-Sena Widow’ story. A woman named Adriana Almeida was once accused of murdering her husband, who had won the lottery in 2007. The lucky man, Renne Senna, won 52 million dollars in the Mega Sena Lottery in 2005. However, his luck ended when he got shot outside a bar just two years after his win. Interestingly enough, Almeida and Senna started dating after he had a few million dollars. Some people thought that the widow had orchestrated the murder to inherit 50 percent of her husbands money. So she would receive about 22.5 million dollars. In the end, Almeida was innocent and she was released in December 2011. She now enjoys the millions of her late husband. A ticket for Mega Sena isn’t very expensive, namely 3 dollars. It becomes even cheaper when you take a subscription package. The lottery rewards you by giving every 10th bet for free. Another option is the so-called ‘Multi Draw package’, which is usually 25 percent cheaper than a normal ticket. The rules of Mega Sena are quite easy, which is big reason for its popularity. Every player has to choose six numbers out of a 1-60 range. You can do this is a manual way called ‘natural selection’ or a random way known as ‘quick pick’. It’s also possible to save your favorite numbers in your account at TheLotter. Just click on ‘My Numbers’ in your account to do so. The Jackpots of Mega Sena are well-known in Brazil. Every year the lottery organizes a super draw called ‘Mega de Virada’. Not only Brazilians but people all over the world can participate. The biggest Jackpot win in Mega Sena history took place in 1999. A very lucky player from Salvador won 35 million dollars! He’s not the only big winner. Another great Jackpot hit took place in 2005 (56 million dollars), 2007 (52.7 million) and 2008 (53.1 million dollars). The winning of Mega Sena are quite good, namely 1 in 50,063,860. It’s 1 in 154,518 for five or six numbers and 1 in 2,332 that someone has four or six matching numbers. It’s definitely another reason to participate! The Mega Sena Lottery draw takes place on Wednesday and Saturday evening at 20.00 Brazilian local time. It’s possible to buy a ticket until three hours before the draw takes place. You can sense the excitement just before the draw! Have you missed the draw? Don’t worry, because you can always check the results at the website of The Lotter at 7.30 GMT. In some ways Mega Sena is different than other lotteries. For example, the winning numbers are pulled out of two drums. The first drum contains the numbers 0 tot 5, while the numbers 0 to 9 are part of the second drum. The six winning numbers are drawn in pairs. This means that one digited is pulled out of each drum to create a two digit number that lies between 1 and 60. Sometimes 00 is drawn. No problem, because then the selection is replaced by the number 60. Mega Sena Players need to have a certain amount of matching numbers to win. Players can end up in just three prize categories on total, namely 4,5 and 6. For example, with 5 matching numbers you’re put into the second prize division. In that case the pay out per winner is 36 million dollars. With 4 matching numbers the pay out per winner is 776,13 dollars.! The advantage of only three prize percentages that players receive a larger percentage of the prize pool. 35 percent of the money is put in the Jackpot, 19 percent to winners who have four matching numbers and another 19 percent to players with four matching numbers. Sometimes a comes true and you win a big prize, maybe even the Jackpot. You need to have six correct numbers to become a new Brazilian millionaire. In that fortunate situation you have 90 days to claim your prize. Sometimes a prize remains unclaimed. In that case the money is given to the Brazilian National Treasury, that donates it to local cultural and social initiatives.